For more than a quarter century, Noble Precision has been a global leader in delivering practical and achievable solutions to address complex precision manufacturing needs and challenges.With 150,000 square feet of manufacturing facilities located in Toronto, Canada, Noble Precision provides the skills and technologies required to resolve unique production demands that are not feasible in-house for our clients. From the moment that we are tasked with a project, regardless of magnitude, we are wholly vested in the process and take full responsibility for delivering a solution that satisfies every parameter of our clients’ specifications. We take immense pride in our capability to convert your unique manufacturing requirements into viable outcomes in a cost-effective and time-efficient manner. From prototypes to single solutions to high-volume production runs, Noble Precision’s fundamental obligation to precision and quality fuels our relentless investment in state-of-the-art technology, including 5-axis simultaneous CNC machines, in order to provide our clients with the most sophisticated and precise machining capabilities worldwide. 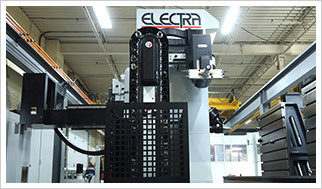 These capabilities include the utilization of modular clamping systems, critical to improving tolerances and reducing production times and costs, as well as the capacity to machine components up to eight meters. As a result, this 5-axis simultaneous CNC machining technology further expands the range of precision manufacturing solutions available to clients competing in such specialized sectors. This cutting-edge technology is sustained by the latest, most up-to-date CAD/CAM software available, and which is central to the automation of our operations. Moreover, all processes are capably supported by highly skilled and qualified machinists and programmers, thereby positioning Noble Precision at the apex of the precision manufacturing industry. For additional information about our specific capabilities and manufacturing technologies, Call Noble Precision at 416-938-6455 or Contact us to request a consultation.